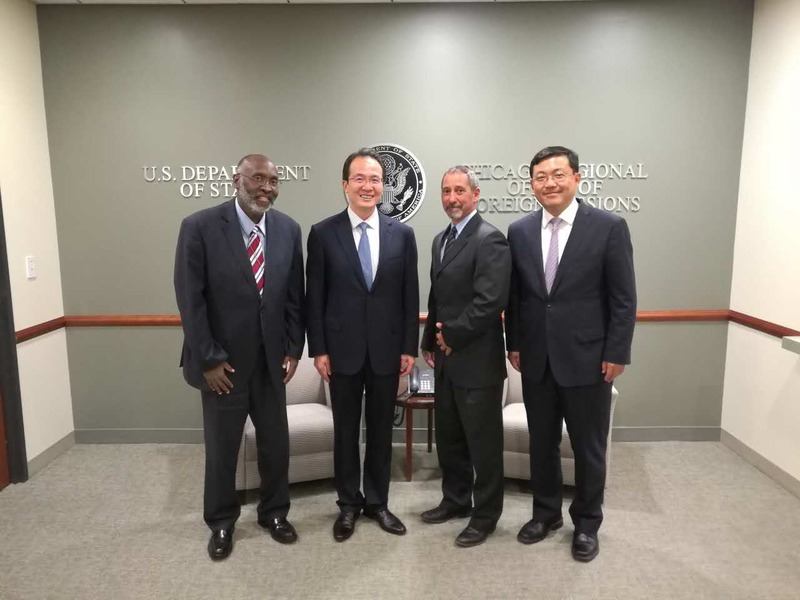 On July 26, Consul General Hong Lei paid a visit to the Chicago Regional Office of Foreign Missions (OFM) and met with Associate Director John J. Monroe and Associate Regional Director Garry Pierrot. Consul General Hong appreciated the efficient service and active assistance provided by the OFM to the Consulate General in the past years, and looked forward to maintaining the effective communication and cooperation with the OFM in the future. Mr. Monroe warmly welcomed Consul General Hong’s arrival at Chicago and agreed to keep close ties with the Consulate General and continue to provide good service. Deputy Consul General Wang Yong and Director Zhou Muliang of the Administrative Office attended the meeting.